Why are the Daleks so popular? The new Doctor Who episode Into the Dalek will be shown tomorrow and I am excited! Why shouldn’t I be? It’s Doctor Who! But many people have stated that it is too early to introduce the Daleks to Capaldi’s Doctor two episodes into the series. I’m optimistic though, after all, every single Doctor (except the Eighth) have faced the Daleks on screen, and the trailer for the episode looks tense and dramatic (which apparently the episode is). But why ARE the Daleks so popular? What makes them so iconic, so interesting, and so cool? 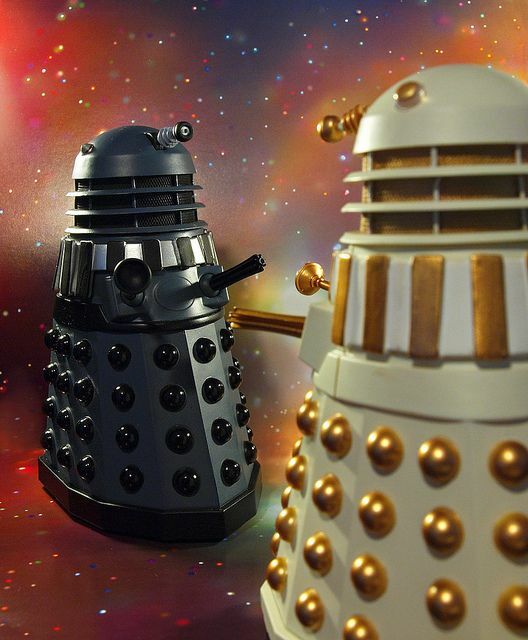 Daleks Three by Johnson Cameraface by Flickr. The Daleks first appeared in 1963 in the story called The Daleks (original, right?). They were the first proper aliens to fight the Doctor and were created by writer Terry Nation, who wrote a story where the Daleks waged war against another race called the Thals. BBC designer Raymond Cusick came up with the iconic design and thus a sci-fi icon was made. The Daleks originally angered Doctor Who creator Sydney Newman, who wanted the show to be semi-educational and didn’t want any bug eyed monsters. However, the Daleks were so popular that the historical aspect of the show moved into the background and the sci fi alien aspects took the foreground, with the Daleks appearing in over 20 stories since and making cameo appearances in many other stories. Davros, a scientist, creates machines to help his race the Kaleds win a war against the Thals. By doing so he removes all emotion from the Kaled soldiers and turns them into weapons the Daleks. They destroy the Thals but unfortunately for him betray him and supposedly kill him* leaving them to go rogue and try to destroy the galaxy. *All of this text plus the Davros text is revealed in Genesis of the Daleks, one of the best Classic Series stories. Even though you know what happens now, it’s still essential Who viewing. 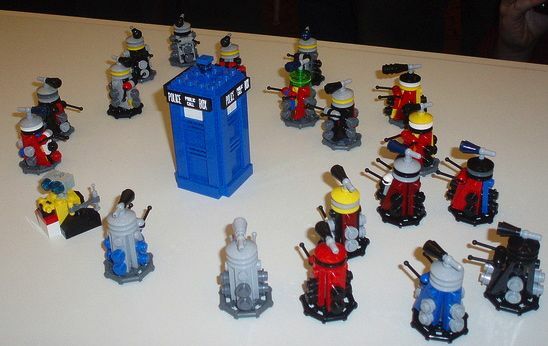 Lego Daleks by James Shields via Flickr. After scattered groups of surviving Daleks brawl Doctors 9 & 10, they trick the Eleventh Doctor into giving them the DNA code needed for the reconstruction of their race*, creating a new Dalek Parliament as seen in Asylum of the Daleks. *As seen in Victory of the Daleks, aka the Skittles episode. And that’s where we’re at in terms of the shows continuity. I could just end this post now and re-name this Dalek 101, but I want to be different and analyse why the Daleks are so popular. The first reason is probably their appearance. By now the Daleks are so iconic and so well-known you can see a Dalek silhouette and know exactly what it is. There’s just something about the design that is so simple yet so ominous and menacing. 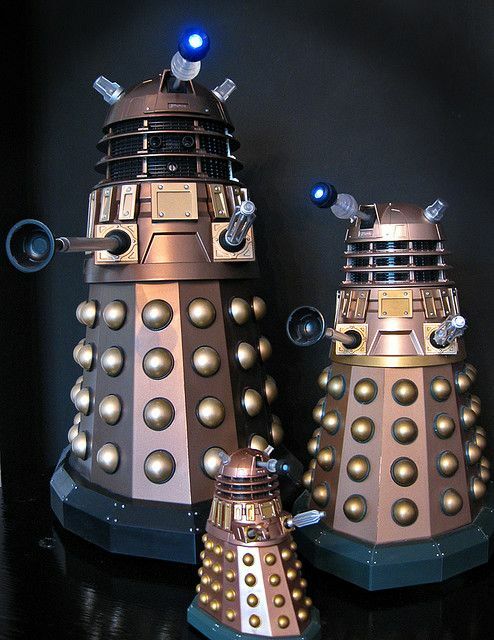 What’s my favourite Dalek design? Well, to be honest, it is the gold-plated New Series Daleks. Unoriginal I know, but the truth. 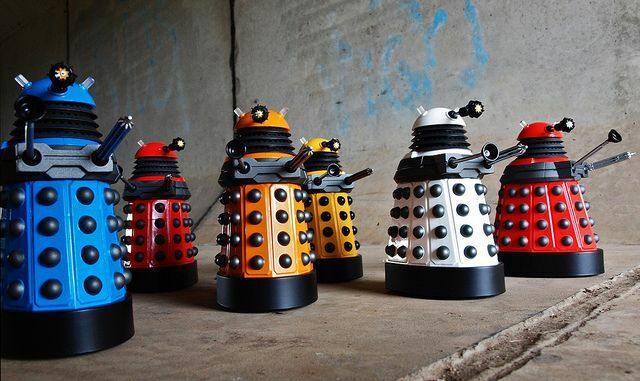 The Daleks – image by Johnson Cameraface via Flickr. The second reason is the fact that they appeal to everyone. When I was younger (David Tennant era), I remember loving the Daleks and now, 8 years on, I still like them. Adults can appreciate the idea of a man (or alien) being turned into a machine and respect the darker parts of the Dalek mythos. There’s a reason Doctor Who Series 1 has a 12 rating well, apart from the Unquiet Dead and The Empty Child, it also has Dalek, a dark and gritty take on the Doctor and Dalek relationship. But the most logical explanation as to why the Daleks are so popular, or at least the reason I think they’re so popular, is because they represent real life. Back in 1963 the people of Britain were still recovering from the war. The images of Nazis and war-torn places were still in people’s minds. The Daleks were used to show the Nazis and people like them, and how evil they were. Both Hitler and Davros hated anything that isn’t them. I can’t be sure, but I think this is what the writers had in mind when they made the Daleks, as a metaphor for evil. So those are three reasons why I think the Daleks were, and still are, one of the most iconic sci-fi monsters of all time. Get ready with your anti Dalek spray tomorrow at 7: 30! Thanks for this, Ben. Despite growing up watching TOS, I didn’t know the background. Years ago I sat inside a dalek in the science museum and did the voice, but despite that, I still find them as menacing as the stone angels.